Pharisees, came with lanterns and torches and weapons” (John 18: 3). Judas, usually shown in proﬁle, approaches Christ from behind to give the kiss, which was a prearranged signal for the soldiers. The kiss, a common form of greeting between friends, identified Jesus as the man they sought. 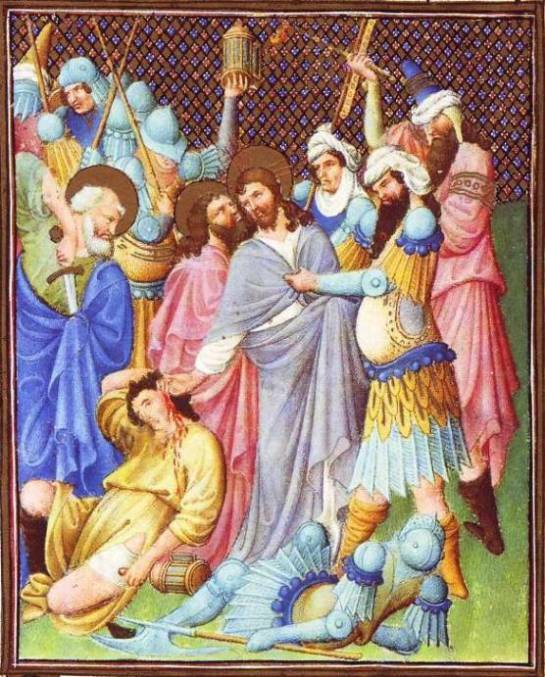 Peter, ever hasty and zealous, who has cut off the ear of Malchus, obeys the command of Christ to return his sword to its scabbard. Christ reaches out to touch and heal the wounded ear. Peter draws the sword through the cloth of his cloak, to wipe off the blood of the soldier he has attacked. Notice the dour faces, disjointed figures, and ﬂat design without clear spatial intervals. But at the rear of the group, the soldiers on the left give an impression of turmoil and agitation.